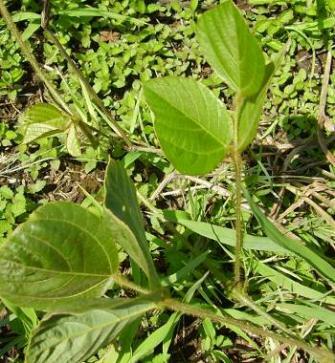 Pueraria montana (Lour.) Merr. var. lobata (Willd.) Maesen & S. M. Almeida ex Sanjappa & Predeep is a perennial, long-running, hairy vine up to 18 m high, somewhat woody, with tuberous roots, leaf stalks and stems covered with rusty-brown hairs. Leaves light green, finely hairy, 3-foliolate; leaflets with entire margins or shallowly lobed, 70-150 mm long, abruptly sharp-pointed but not bristle-tipped. Flowers, reddish-purple, fragrant, in spikes up to 300 mm long, flowering time from March-April. Pods flattened, clustered, 50-130 mm, covered with long rusting-brown hairs. Native to southern Japan, southeastern China and Eastern Asia. 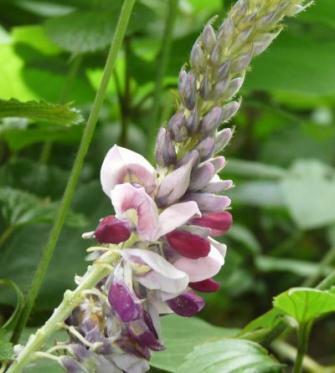 It is invasive in other countries such as the US, where it was introduced around 1870 for a Centennial exhibition and later promoted as a forage crop and planted widely along highways for erosion control. It is also invasive in Canada. Kudzu vine is an aggressive invader, spreading mainly by vegetative means, using its stolons (runners) that root at the nodes and also by rhizomes. As many as 30 vines may grow from a single crown or single root. It also produces seeds of which few are viable. Other means of spread may be by wind, birds and mammals as well as water. Kudzu vine was probably introduced into South Africa as an ornamental and for erosion control. The earliest record at the Pretoria National Herbarium is of a specimen collected in Mpumalanga at Brookland State Forest in 1985 and has since spread to Schagen valley between Sudwala and Rosehaugh. It has been recorded in Limpopo and KwaZulu-Natal. Kudzu vine forms dense mats over the ground, debris, shrubs and trees by twining around objects. It invades forest margins and gaps, riverbanks and moist areas. It smothers desirable plants and causes them to collapse. 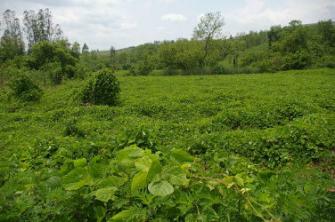 Kudzu vine is a legume, thus can fix nitrogen and enhance the soil fertility. This may also affect indigenous species. It is very drought tolerant which makes it more aggressive. In the US kudzu vine has taken over many areas, especially the southern parts of the country, and control amounts to billions of dollars. Farmers need to be aware of kudzu vine as it can be mistaken for soybean when it is still young, and it can be an alternate host for soybean rust. The registered herbicide for kudzu vine is Triclopyr. The plant can also be killed by uprooting the root crown and all rooting runners and these must be destroyed. Repeated mowing or heavy grazing can exhaust plants and assist with control measures. Report sightings of these plants to the Early Detection and Rapid Response Programme (EDRR) team. We will need to know its locality (the exact locality, supply any landmarks of GPS information if possible). USDA Forest Service, Forest Health Staff, Newtown Square, PA.